Tire blowouts cause about 11,000 traffic accidents and nearly 200 deaths each year in the U.S., the National Highway Traffic Safety Administration (NHTSA) reports. While a tire blowout can happen at any time, the heat of summer is one of the known stress factors that can substantially increase the risk of a blowout – especially when tires may be defective, worn down or improperly maintained. If you aren’t as diligent as you maybe should be about maintaining your tires or you simply don’t know what to do when it comes to proper tire maintenance (which is critical to minimizing the chances of tire blowouts), be sure to check out this article. And, if you are in a car accident that may be caused by a tire blowout on another vehicle, don’t hesitate to contact the Portland car accident lawyers at the Savage Law Firm to find out more about your best options for obtaining compensation for your injuries, damages and losses. 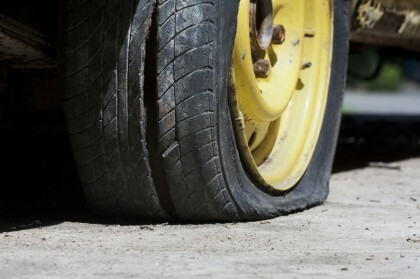 Tire blowouts, which cause about 11,000 car accidents annually, are far more likely to occur in the hot summer months. Here are some tips to prevent tire blowouts this summer. Tip 1 – Know your tires. All tires are different and have different maintenance/care requirements, and these can be found in your car’s owner’s manual. Make sure you take the time to read the detailed instructions regarding basic care and maintenance for your tires and that you follow the manufacturer’s guidelines regarding proper tire maintenance. Increasing the load-carrying abilities of a vehicle. Tip 2 – Respond to any tire recalls as directed. Like other pieces of vehicle equipment, tires are not immune to defects, and as a result, they can be the subjects of manufacturer recalls. If you end up receiving a notice (or otherwise finding out) about a tire recall for tires you own, make sure to act immediately by getting the tires replaced (or responding as directed). Driving on recalled, potentially defective tires will only increase your risk of experiencing blowouts and, in turn, car accidents. Tip 3 – Check and adjust tires’ air pressure as necessary. By following these tips for preventing tire blowouts, you can extend the life of your tires, improve your vehicle’s fuel economy and reduce your risk of car accidents. Keeping your tires’ air pressure within the manufacturer’s suggested guidelines is a critical part of proper tire maintenance that can also reduce the risk of tire blowouts. In fact, as the NHTSA reports, when tires are underinflated by at least 25 percent, they are about three times more likely to be cited as one of the primary causes of car accidents. Get in the habit of checking your tires’ air pressure once a month at the very minimum. When checking the air pressure, make so do this this when the tires are “cold” (i.e., after the car has not been driven for at least 3 hours). It’s a good idea to keep a portable pressure gauge in the trunk of your car so you can check tire pressure easily on the go. 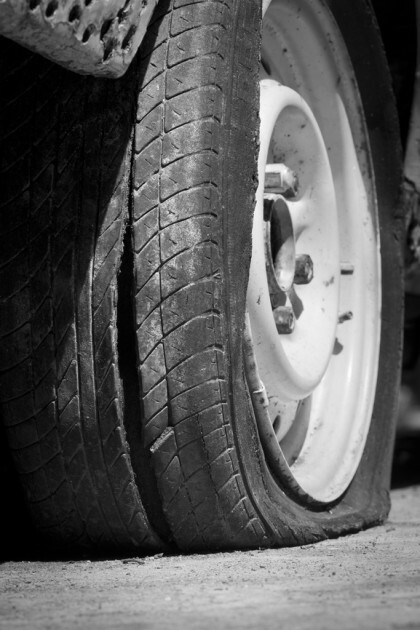 If you hit a curb, manhole, object in the road or pothole, be sure to check tire pressure after these incidents, as they can lead to a loss of tire pressure. Tip 4 – Rotate and balance the tires regularly. Veer off to the right or left when attempting to drive straight (on a level roadway). To avoid these issues – and to get the maximum life and wear out of your vehicles’ tires, make sure you get your tires rotated and aligned on a regular basis (as recommended by the manufacturer). Tip 5 – Check the tread. At the very minimum, tires should have at least 2/32” of tread on them for standard driving conditions (i.e., when there are no poor weather or road conditions to contend with). You can check to see if your tires have at least this much tread by placing a penny, facing upside down, between the tread grooves. If the top of Lincoln’s head is covered by the tread, there is at least 2/32” of tread remaining. In rainy conditions, tires should have at least 4/32” of tread to provide sufficient traction for safe driving. To check this amount of tread, place a quarter, facing upside down, between the tread grooves. If the top of Washington’s head is covered by the tread, then there is at least 4/32” of tread remaining. In snowy conditions, tires should have at least 6/32” of tread on them. To check this, use the penny test again. If the tread covers the top of the Lincoln Memorial on the back of the penny, then there is at least 6/32” of tread remaining. Tip 6 – Replace your tires when necessary. While this may seem like a very obvious tip for preventing tire blowouts, the fact is that some people will try to squeeze as much mileage out of their tires as possible by continuing to drive on tires that are clearly worn out and that clearly need to be replaced. This is a dangerous gamble with their safety, as well as the safety of other people on the road, because worn down tires are far more likely to blowout with even the slightest complications (like, for example, hitting a curb or a small object in the roadway). Therefore, being diligent about replacing a vehicle’s tires when their life is clearly up will be critical to minimizing the risk of blowouts and car accidents. If you’ve been injured in a car accident, it’s time to turn to the Portland car accident attorneys at the Savage Law Firm. For more than 30 years, we have been providing car accident survivors with the highest quality legal services so they can obtain the settlements they deserve. While this means that our Portland car accident lawyers will work diligently to help our clients tell their stories in court, it also means that our attorneys and dedicated staff will vigorously stand up to insurers and others outside of the courtroom to ensure that our clients are able to obtain the best possible outcomes to their cases.